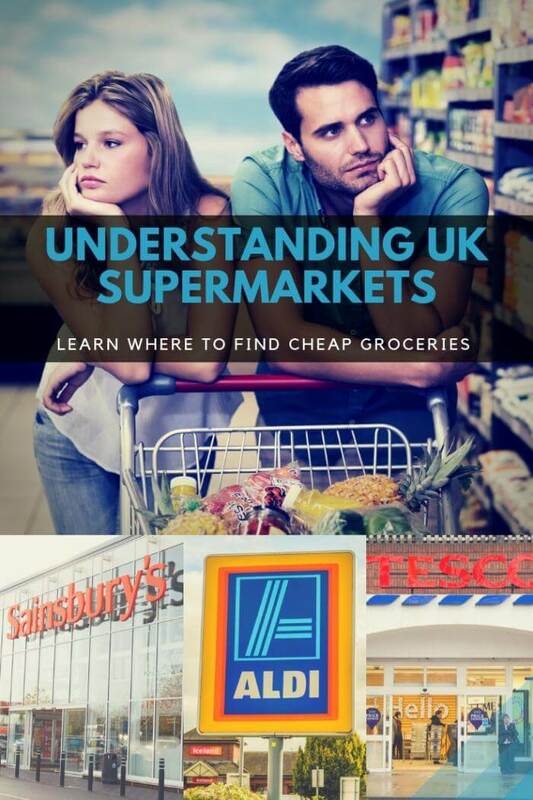 Confused by all the different UK supermarket chains? Want to know where to find cheap groceries? This guide is for you. Yes, I love going to the supermarket. I know some people see them as a necessary evil, but when I first moved to London, going into those huge supermarkets made me all giddy inside – and it still does. However, if you’re new to the UK (or just haven’t been paying enough attention), understanding the difference between Tesco and Aldi can be confusing. Where do you go if you want cheap groceries? Where do you go for the biggest selection? And should you bother with the supermarkets’ own-brand products? Well, as a supermarket-addict, I’m here to help. This is my guide and comparison of all the major supermarket chains that operate in London (and the UK), ordered by their current market share (as reported by consumer research company Kantar WorldPanel). 1. The ratings are based on MY OWN observations and opinions. 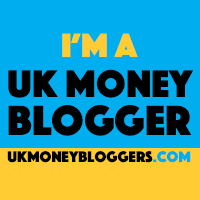 Prices change constantly, and needs vary – a big family will have different needs than a young student, etc’ – so take my ratings only as a rough guide, and see what works best for you. 2. As someone who loves to find deals and cheap stuff to buy, I try to go to as many different supermarkets as I can. However, the two stores closest to me are a big Sainsbury’s and an Iceland branch – so if I’m a little biased towards them, it’s because I visit them most often. Still, I have no problem saying Sainsbury’s are most certainly NOT the cheapest supermarket chain out there. 3. Most of the major supermarket chains have their own home delivery websites. I’ll write about those in a separate, future article. 4. For general tips on how to save money at the supermarket, see my list of 25 tips and tricks. 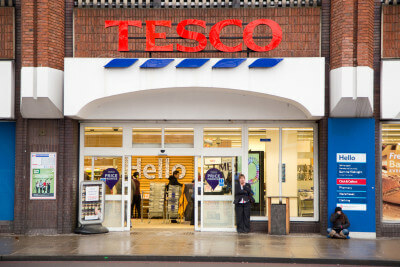 The UK’s biggest supermarket chain (in terms of market share), Tesco have more than 3,400 stores across the nation – some very big, and some small, local stores. Among the big supermarket chains, they’re considered one of the cheaper ones, though not the cheapest in most cases. Tesco’s spread in London is pretty good, though in the centre you’re more likely to find their smaller stores – where prices are often higher. Tesco’s loyalty card, the “Clubcard”, gives you 1 point per £1 spent. Redemption is a bit more confusing though, having to convert those points into vouchers. The stores are usually very clean and inviting, and queuing is kept to a minimum in most cases, at least in stores where there are enough self-checkout stands. Some smaller branches do not have them – in which case you might have to wait a while on a busy day. The UK’s second-largest supermarket chain (though these numbers keep changing), Sainsbury’s is similar to Tesco in the number of stores, their size, and the variety of products. Their pricing, however, is considered a bit more expensive among the bigger chains. Note: Sainsbury’s are in the process of merging with former supermarket rival ASDA. As mentioned above, I have a big Sainsbury’s right next door, so I’m a bit biased – but other than the pricing which is sometimes too high, I mostly have good things to say about Sainsbury’s. 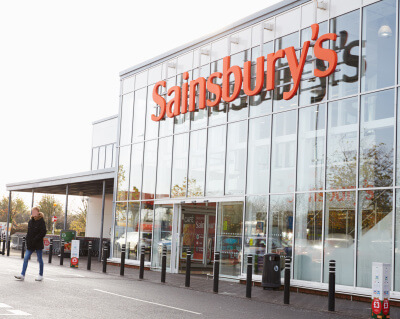 Unlike Tesco, Sainsbury’s only have two store “formats” – Local, which are the smaller neighbourhood stores, and “Superstore”, which is basically everything else – though some can be a lot bigger than others. The variety of products is usually pretty good (they also own Argos, so many stores have an Argos branch in-store). Their own-brand products are usually very good, though the different names can get confusing – there’s Sainsbury’s Basic, which is the cheap line (with the quality being hit-or-miss: sometimes you get an excellent product for very cheap, and sometimes you’re better off staying away). Then there’s “By Sainsbury’s”, which is their “regular” own-brand name, with mid-tier products and prices. And then there “Taste the Difference”, the so-called “premium” products, in quality and pricing. Though, the quality doesn’t always justify the higher pricing. The stores themselves are usually very clean and tidy, with self-checkouts that help with the queuing. The “Nectar” loyalty card lets you collect points (1 point per £1), and then use these points either in Sainsbury’s or in a variety of other stores. The third largest supermarket chain in the UK in terms of market share (at least as of this writing), ASDA, owned by US giant Walmart, are known for their aggressive pricing, often making them cheaper than the other two big chains. 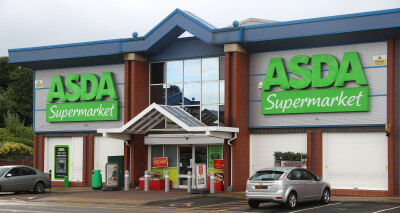 While it might be a bit harder for you to find an ASDA store (as they have considerably less locations than Tesco and Sainsbury’s), it’s usually worth your while to do so – as they offer a very similar variety, quality and in-store experience – for a cheaper price. While ASDA’s big stores are usually not as “sparkly” as the Tesco and Sainsbury’s one, but the value for money makes up for it. Their self-checkout machines are a bit overly-sensitive, which can cause a bit of a queue. Overall, between the big three chains, if you have a big-enough ASDA store close by – it should probably be your first choice. Founded in Yorkshire more than 100 years ago, Morrisons is now the UK’s fourth largest supermarket chain. Their big stores emphasise fresh produce, with the “Market Street” concept – a section of the store that cobbles together the butcher, a bakery, a fishmonger, etc’,. Store Sizes: One name in a variety of sizes. I can’t say much about Morrisons, since their lower shop count in London means they don’t have any stores near me. Therefore, I rarely visit them. 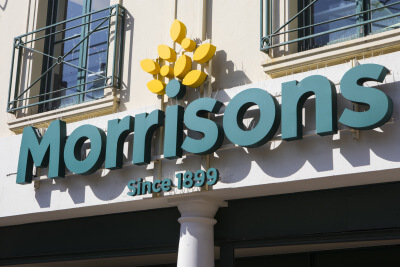 Their revamped loyalty card, Morrisons More, is pretty easy to understand – you collect points as you buy (5 points for every £1), and can then get a £5 voucher for every 5,000 points. 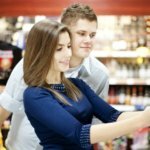 With super-cheap prices yet an incomplete variety of products (in most cases), they offer a unique grocery-shopping experience. Store Sizes: One name (Aldi) in a variety of sizes. If grocery costs are your main concern – you should always start with Aldi (or Lidl). The discount German chain is rattling the supermarket world in the UK, so much so that even Tesco are reportedly planning to open a special “discount” chain. Going to an Aldi store might not be the experience you’re used to from the big, tidy chains – the stores are usually smaller and more cramped, the floor is not as shiny, and shelves sometimes go empty. Plus, you’ll see a lot more queuing, with no self-checkout tills. The other side of that, however, is the incredible value for money – while not every product in every category is going to be cheaper than the other stores – your combined weekly shop will, almost certainly, be cheaper than the bigger chains. Keep in mind, the variety of products keeps changing, and while you’ll always find “the basics”, some products you bought and loved one day might not be there next week. And if you have specific dietary needs (like Gluten Free or vegan), it’s even harder to rely on them. 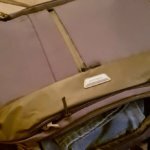 For me, Aldi (or Lidl) can usually not complete my ENTIRE weekly buy – but I make a point of going there every couple of weeks, to stock up on cheap essentials. 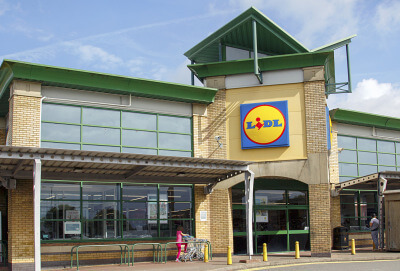 The second heavy discount chain to come to our shores from Germany, Lidl is very similar to Aldi – very cheap prices, limited choice of products, and high-quality, cheap own-brand products. 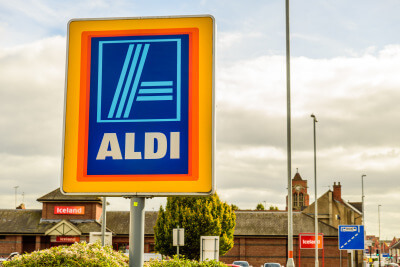 Lidl’s market share is currently smaller than Aldi’s – but they’re growing fast, with UK consumers eager to lower the cost of their weekly grocery shopping. Store Sizes: One name (Lidl) in a variety of sizes. Between the two German discount chains, I’m more familiar with Lidl, simply because they’re closer to where I live – so I go there at least 2-3 times a month. Granted, just like Aldi, it’s a different experience than the one you get in a big Tesco or Sainsbury’s – the stores are usually smaller, not as organised, and often not fully-stocked. Earlier this year, they finally introduced self-checkout tills, but the software is very fussy at the moment – when I have a full trolley, I often prefer to go to a manned checkout (a first for me!) – but since there aren’t a lot of them, there’s often a hefty queuing time. They have changing “specials”, where they celebrate Italy week or American week with new products for a limited fun. It’s fun to discover new stuff every couple of weeks – it’s just annoying that if you find something you really like, you probably won’t see it again at the store for months (if ever). The supermarket essentials, however, are all there, and for cheap – from meat to dairy to high-quality own-brand cleaning products. When it comes to their food own-brand products, the quality really fluctuates. Personally I’m always pleased with the quality of their in-house meat and fish, but can’t stand their own-brand beans, for example – so your mileage may vary. While completing a full weekly shop there is sometimes difficult, if you at least go there a couple of times a month to stock up on essentials, you’ll definitely save money. As with “Morrisons”, I don’t visit Waitrose a lot because they don’t have stores near me – so I don’t have a lot of first-hand knowledge. However, there’s a reason I don’t go out of my way to find Waitrose stores – they’re expensive. Now, to be fair, if you look at many of the common items, their prices are usually very similar to those of Tesco and Sainsbury’s (in fact, they have a Tesco Price Match guarantee on 1,000 products). But if you compare a full weekly shop, you’ll usually pay more – because their “speciality” items and fresh produce often cost more. They do have high-quality products, but is that enough to go out of my way and pay more? Not for me. 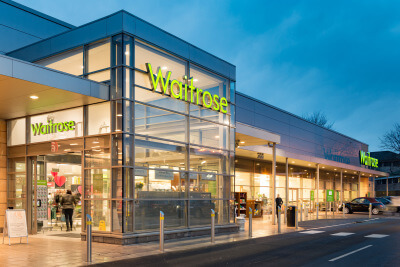 Waitrose’s loyalty scheme doesn’t make you collect points – you simply gets regular benefits (such as free coffee/tea) and changing offers and discounts. A unique supermarket chain that focuses on frozen food and ready-meals, with cheap prices. They do offer a selection of “regular” grocery items as well, but it’s very limited in most stores. 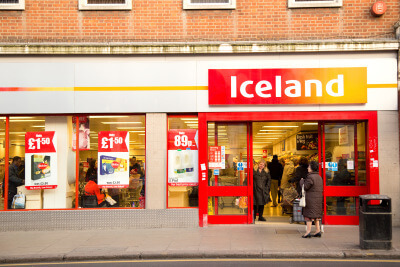 I like shopping at Iceland – they’re cheap, they have weird frozen stuff, and they have a branch near me so that helps too. However, I also have several issues with them. For one, despite the fact that they’re still usually cheap, prices have been creeping up fast and hard in recent months. While it’s true that most supermarkets had to raise prices following Brexit and the pound dropping, it’s been a little too prominent with Iceland’s prices – sometimes I find identical products that are cheaper at Sainsbury’s (gasp!). And don’t even get me started on their Bonus “loyalty” card, which is basically a savings card – you “load it” with £20, and get an additional £1 as a bonus. That’s a pass for me. The bottom line? If you can find the products you’re interested in, they’ll be cheaper in most (but not all) cases – so Iceland might be worth a trip. Besides the big supermarket chains, there are several smaller chains throughout London and the UK – I can’t write about all of them, but I should at least mention three: CO-OP Food, Marks and Spencer, and Whole Foods Market. CO-OP Food (Previously “The Co-operative Food”) is a bit different than the other supermarket chains, in that it’s comprised of 15 different co-operative societies that operate the shops under a single brand. Therefore, while the offers and own-brand products are generally the same, you can still see differences between different Co-op stores around the country. Most of the Co-op stores are smaller in size (at least in London), and the prices are generally high, though their special offers do sometimes make a good bargain. Their own-brand products are usually of high quality, but again, they’re often more expensive than other chains – unless they’re on sale. Since I have a small Co-op food store near me, I do go there occasionally, but I’m very careful with what I buy because of the prices. Marks and Spencer: Surely you’ve heard of Marks and Spencer as a clothes and fashion chain – well, many of their stores also have a food section, which is a bit of an odd mix. Still, M&S’ supermarkets offer high-quality own-brand products, and speciality foods and products that are sometimes hard to find in other places. But the quality comes at a price, and you’re likely to pay more when you shop there. Whole Foods Market: The American chain (which was bought by Amazon in 2017) only has 7 stores in London (as of this writing), but they’re special enough to be worthy of a mention. Whole Foods specialises in organic, healthy and speciality foods – so you’ll find an impressive variety of gluten-free products, for example, as well as vegan, sugar-free, and even healthier snacks. The problem? The pricing. Almost everything in Whole Foods is expensive (even identical products that can be found in regular supermarkets would often cost more at Whole Foods), and even though Amazon has said they would lower prices, I can’t say I’ve seen that in a major way yet.